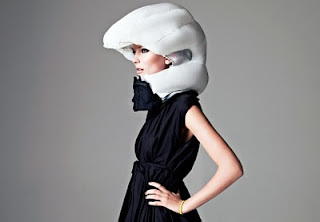 Hövding, produced by swedish design company hövding sverige ab, is an airbag system for bicyclists, designed as a fashionable but practical alternative to helmets. A hood-shaped, nylon airbag is encased within a neck collar and is automatically inflated in the event of a crash by a sensor system. Washable fabric shells that fit over the collar create a range of looks for the device, designed to seamlessly incorporate into one's daily outfits.